Ruth Ann’s educational and work background lie in the Health Services sector. For years Ruth Ann worked in the field of Blood Bank Technology in a hospital setting followed by national blood bank services upon moving in 1981 to Scottsdale Arizona. Ruth Ann found a secondary career in front and back office administration for doctors and then finance and office administration for the Episcopal Church in Arizona. 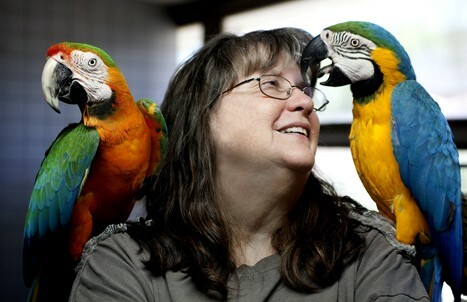 Upon adopting a Blue-Fronted Amazon parrot in 1998, Ruth Ann and her husband, Tom, found The Oasis Sanctuary to be a place for volunteer work in order to honor the intelligence and longevity of parrots. What started out as cage-cleaning work evolved into foster care service at the time the Sanctuary moved to Benson Arizona in 2000. Since 2000 the scope of foster care work increased to full time medical and foster support in the Phoenix area. Ruth Ann assumed limited office responsibilities in 2009 and became the Business Manager for Oasis Sanctuary Foundation LDT upon the retirement of Charlotte Fox in 2013. Tom & Ruth Ann La Rue provide foster care at their home, fondly named Chez La Rue. Their home is also the physical location for The Oasis Sanctuary’s business office.